The magnitude of the cost, both to the individual and the economy as a whole, represented by eating disorders is often underestimated. The growing numbers presenting to services in high income countries is not merely a reflection of service availability, but a very real increase in the number of cases. 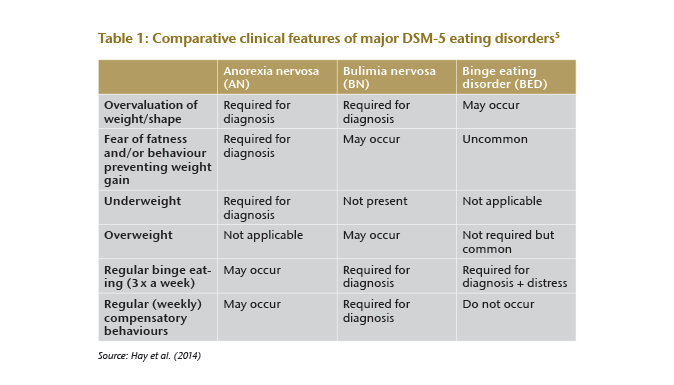 The symptoms of the three commonest eating disorders described in American Psychiatric Association’s DSM-5 are compared in Table 1. A diagnosis of AN requires behavioural disturbances that significantly restrict energy intake, leading to a significantly low body weight coupled with a disturbance in the individuals’ experience of their body shape and weight. The individual also harbours an intense fear of gaining weight. Those with “restricting type” AN lose weight primarily by fasting and exercise whilst the “binge eating/purging type” induces vomiting and may also use enemas, laxatives and diuretics to reduce their weight. 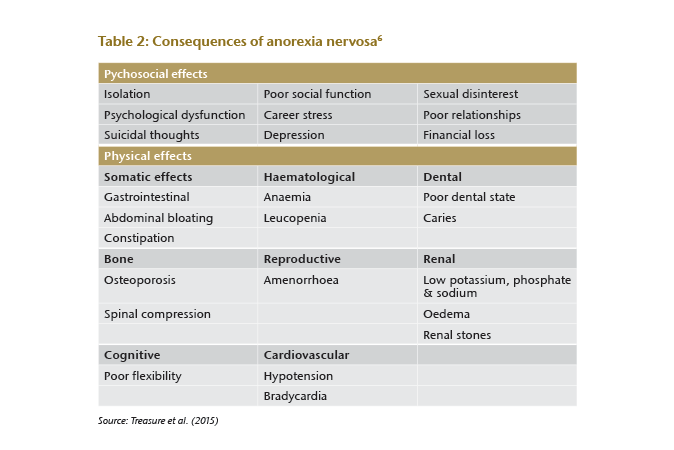 Clearly these behaviours will have a profound effect on many systems of the body, bringing their own complications, essentially those of starvation (see Table 2). Although patients with BN rely unduly on their perception of body weight when evaluating themselves, they are much less likely to be underweight than those with AN. A recurrent cycle of consuming large amounts of food followed by “compensatory behaviours”, similar to those of AN, is accompanied by a feeling of lack of control over eating. A number of technical difficulties arise in interpreting the mortality studies for those who experience AN. Study populations vary, as do diagnostic criteria, length of follow-up and age structure, all of which can influence the outcomes. However, all studies agree that mortality of AN patients has significantly increased compared to the general population. Most developed countries have seen an increase in the numbers presenting for treatment over recent years.16 In the most severe forms of AN, inpatient treatment is indicated for refeeding, which must be undertaken with care to avoid “overfeeding syndrome”.17 The precise components of inpatient therapy are not well-described and most patients require follow-up outpatient work. Many more are treated with a variety of psychological interventions as outpatients. Family-based interventions have been at the core of therapy over the years but, again, these are often not well-structured or defined. 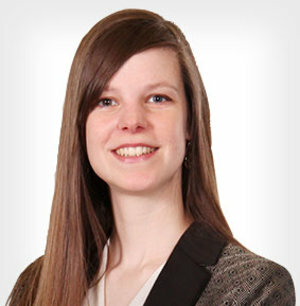 The Maudsley Model of Anorexia Treatment for Adults (MANTRA) targets specific domains central to the maintenance of AN for treatment: inflexibility and over-attention to detail, impairments in the emotion-social domain, positive beliefs about how AN helps the person and the unhelpful responses of families. This highly structured therapy has demonstrated positive results compared to other treatment.18 Pharmacological therapies have very limited use in managing core symptoms but may be valuable for treating comorbidities. The excess mortality exhibited by eating disorders, particularly AN, is of concern to underwriters. The outcome studies are often difficult to interpret in individual cases and care must be taken when applying these figures to the insured population. 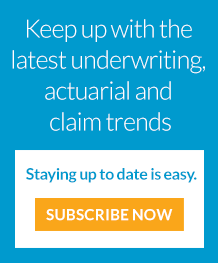 Those who apply for insurance are more likely to be in the good outcome group. 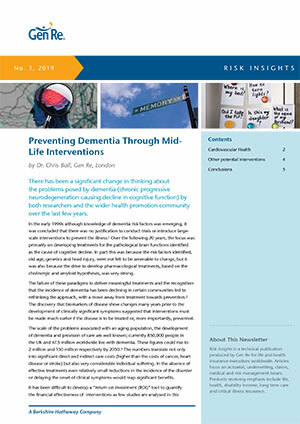 Underwriters should be looking at the current BMI, length of illness, mental health comorbidities and suicide attempts as indicators of likely risk. People who make good recoveries after short illnesses, maintain their weight, have good social adjustment and are without mental health comorbidities are unlikely to be at risk of significantly greater mortality than the population as a whole.